Observed at a light near Lake Baringo, Rift Valley, Kenya. October 2016. This insect shows two common patterns that have evolved to improve survival by making it difficult for visual predators, particularily birds, to identify and catch prey. First, looking at the head region it appears as if there are two eyes looking straight up. Birds find greater hunting success with surprise. An insect that sees the oncoming threat may well jump off or fly in time to avoid and thereby frustrate the predator. Thus a hungry bird may delay or change its direction of attack. 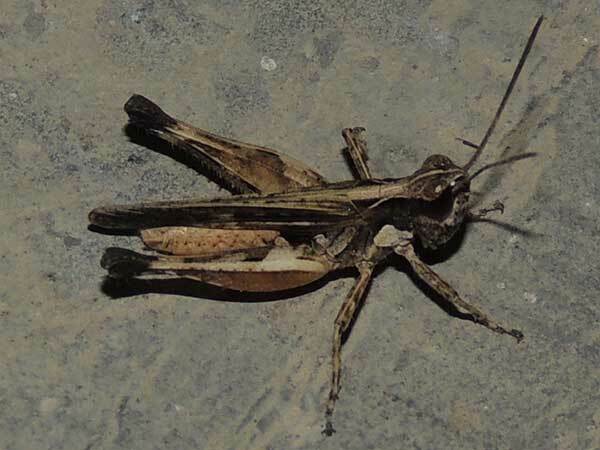 The pattern of this grasshopper also uses exagerated light and dark markings that disrupt the outlines of identifiable features. Thus the true eyes, the legs and the whole body disappear in a habitat with intense light and too much contrast. Copyright Michael J. Plagens, page created 27 June 2016.